Our obsessive focus on play and all the books, articles and websites on the subject seems a little ironic. Wasn’t exploring, creating, learning and socializing through independent play once the traditional childhood pastime? And now we seem to be struggling to get play back. Where exactly did it go? I guess I’ll save that mystery for another day, but I bring this up now as a reminder that play did and still does come naturally to children. Kids don’t need us to teach or show them how to do it (or do it for them while they watch). They do need us to provide a reasonably enriching, welcoming and safe environment and keep distractions (like us) at bay…which is easier said than done. Make time for play part of your daily routine — a big part. From early infancy on, let the time between meals and sleep belong to play. Create a safe place geared to your child’s mobility so you don’t overwhelm her with space and choices or cramp her style. A small room or cordoned off section of a room usually is enough for the first couple of years. Make the space comfortable for you to sit in or near, and convenient enough for you to be in earshot while you attend to your activities. Outdoor spaces are preferable whenever possible. The routines we create should be flexible and built to suit our child’s rhythms. Routines become habits, and there is no better habit for children than play. Present play positively, honestly, gradually. 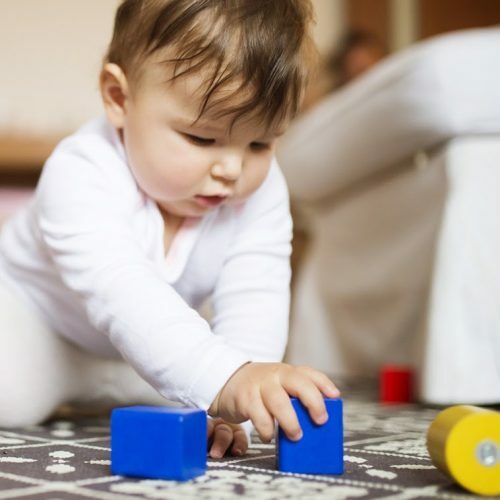 Playtime is a gift for babies and children…and for parents, too, because we have an occupied child and the opportunity to take a break or get work done. But since children have special radar that detects our agenda a mile away, we can’t get away with trying to dump and go. No one of any age wants to feel like they’re being dumped or set aside for more important things. Make the transition to playtime slow and gradual. Hang out for a while, nourish your child with your attention, and then tell her where you will be, what you will be doing, when you’ll be back. Parents who sneak away end up with children who don’t focus well or play for long. They’re looking over their shoulder to see whether we’ve left. Don’t roll the ball back. Learn to foster independent play while you’re together. I know, not rolling a ball back when your baby rolls it toward you sounds almost sacrilegious. But when we observe children play, we notice that much of what they do is experimentation. “What happens if I push this ball?” they wonder. These experiments will continue if we can refrain from interfering. It’s always super easy for us to do something that engages our children — harder to just quietly watch, or offer a simple reflection like, “you pushed that ball and it rolled away,” which doesn’t alter their inner-directed train of thought but does assure them we’re paying attention. Beware of overstimulation and screens. Children don’t invent play if they have the option of screens (television, computer, smartphone…). Try not to use screens at all for the first years, and limit their use to late afternoon downtime after you introduce them. If you are hoping to establish the habit of play as self-entertainment, screens will undo you. Don’t fear the boredom monster. What appears to be boredom is usually tiredness or the healthy bit of inertia children need just before the next good idea materializes. Boredom, imagination, and the ease with which children once played independently are all one, and they are becoming extinct together. Who can tolerate a moment of inertia when screens are readily available for entertainment and distraction? *Sigh* Don’t get me started. I share more about fostering independent play in Elevating Child Care: A Guide to Respectful Parenting. My numerous posts on play, especially Stop Entertaining Your Toddler in 3 Steps, Becoming Unglued, Solo Engagement, How To Stop Entertaining Your Baby and 7 Myths That Discourage Independent Play. Thank you for this wonderful post! It arrived in my email at the perfect time. I am talking with one of my parent education groups about play next week and will use this as a supplement! Great, Nicollete! Thanks so much! Hi Janet, thank you a lot for this great post. My daughter is 13 months old and since 3 months doesn’t want to play too much on her own. She requires my attention and every play doesn’t last too long, so it’s difficult for me to even cook dinner or do anything else when I’m with her. I will try to use your tips and encourage her to entertain on her own 🙂 I’m wondering what should I do with books? My daughter loves books, she comes to me with books, sits down on my laps and wants me to explain images. Is it wrong that I do that and name animals or other objects? I am a mother of 3 (grown) girls and a special educator who works with children birth-5. I work with many families and one of my most prevalent worries is that parents don’t spend enough time connecting with their children. Whether it be lack of time, knowledge or something else, I believe we should wholeheartedly be encouraging and celebrating when children or parents reach out to each other, in whatever form that takes,(physical affection, being silly, wondering about life, creating beauty) not be worried about “independence” at such a young age. Thanks so much for your interest in this topic. One distinction that I think is really important that I didn’t quite hear you articulate in your response to Eileen is that you are not advocating ignoring a clear communication from a child! If a child who has learned the game of rolling a ball back and forth tried to initiate that game, I am sure you would encourage us to respond lovingly and authentically by either accepting their invitation to play or telling them something like “I see you really want to play the rolling the ball game with me! I love playing with you, but right now I’m busy.” You are just advocating not taking over the child’s play and demonstrating the “correct” way to play with an object out of knee jerk habit. 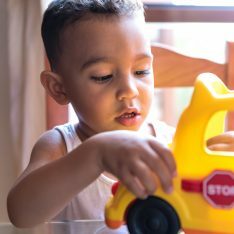 Children learn so much more about an object and play with it for so much longer when they aren’t shown how to play with it, as Alison Gopnik’s research shows. 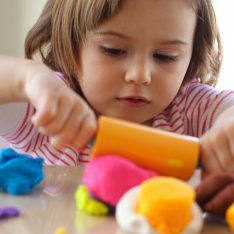 I don’t think you are advocating not responding, you are advocating a mindful response that springs from being sensitively attuned to the child, and not from assuming either that you know what the child’s agenda is, or that your agenda is more important than the child’s as far as play is concerned. Independence for young children doesn’t mean pushing them to do things on their own, it means noticing and respecting what they are actually already doing as full, real people with agendas of their own and allowing them to have those agendas and not getting in the way! I love that you talked in your podcast response about how we don’t leave children alone or say no to an activity because we are trying to push them or force them to be independent, but rather because we genuinely need to do something else and aren’t available in that moment. We trust they can handle that. But we aren’t manipulating or pushing them into being anything or as Eileen put it “worrying about independence”. I love your work! Thank you so much and keep it coming! My 15 month old son has recently started walking and he becomes very upset if he is confined to a specific room or area to play. Do you have suggestions for this situation? Thanks. Hi Janine! I would start by developing a predictable routine… certain times of day when you leave him in his safe play space. Tell him the steps beforehand: “Now it’s time for your breakfast and after that you’ll have some time to play in your play space, while I work in the kitchen” (or whatever). Then, separate very confidently, actually encouraging him to share his complaints as you check back in with him every couple of minutes. It will help if you can perceive these as healthy assertions, “Hey, I didn’t say you could leave! I want you with me every second!” rather than sadness and abandonment (which he would only feel if he had no trust in your relationship). Children your boy’s age sometimes feel more separation anxiety, which makes sense… He’s walking now and more aware of you being able to move away from each other. It’s a normal phase and nothing to worry about, but I would be sensitive to it and not leave for long periods. Start with just 5 minutes away doing the things you need to do. If he yells at you when you return, acknowledge that confidently, “Wow, you did not LIKE me to leave you. I hear that!” Again, don’t perceive him as sad or pathetic. This is a sign of a strong child. This is fantastic advice – I will try to follow it. I want my 10 month old to explore and be able to play on her own, and as the oldest child, I’m afraid she’s not going to learn that easily. Sounds good, Sarah. Thank you. I am so happy I stumbled upon your blog a few months ago! My daughter was born 2.5 months premature and I was told to give her an hour of tummy time per day and she absolutely hated it. I decided to trust the process and stop giving her tummy time but give her lots of unrestricted floor time on her play mat. I stopped trying to entertain her and let her play on her own until she needed me. Now at 9 months (6.5 corrected) she LOVES playing independently, can sit up, crawl, and pulls herself up to stand on everything! She’s a happy curious and confident baby and I am so grateful for all of your articles. Thank you, Janet! cry and cry but I do think he ought to be able to play without 100% of my attention and complete access to my physical body. I wish this article provided guidance for this scenario. Ever since my sister (who’s pregnant) introduced me to RIE, I’m obsessed. At first I was hesitant, but after slowly trying to get my 9 month old to play more by himself (starting around 8 months), he has BLOSSOMED! He’s finally rolling around and exploring everything. Plus, I’m not entertaining him so much. However, I seem to not know where to not interfere. For instance, your first statement about trying to NOT roll the ball back to him…oh no!! We thought it was so cute when we first noticed him rolling to (what seems to be us) and we enjoy “playing” with him at times. How do I know where to draw the line? Do we never “interfere” and play back? I’m working on not interrupting him as long as he’s playing/exploring and happy, which I used to do a lot. And looking back at the first few months, ouch, no wonder he was so clingy. I was always interrupting him and trying to get him interested in “rattles” and other “baby toys”…why did I interrupt him when he would stare at the fan or the tissue box for the longest time. I wish I had found RIE so much earlier. I love your articles. When do I know I can “play” and interact with him vs to not? Hi Beth! Thanks for so candidly sharing your process! I love how you’ve embraced this approach. Rolling the ball back to him is fine. This isn’t about “never” or “always.” It’s an awareness that it is positive and encouraging for children to be trusted to follow their own inner-direction and that our play choices tend to shift our child’s direction quite a bit. Children don’t need to do this all the time, but it does help if they have some time each day to be the sole director of their play. So, the way that might look is when he rolls the ball, you engage with him in a less active way by saying…”Ah, you rolled that to me. 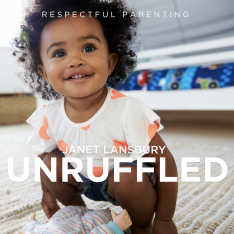 Thank you!” As adults we are naturally inclined to make a lot of assumptions.. “Oh, this means I’m supposed to roll it back…” When the child may have another idea altogether. But once you’ve introduced this game, it’s fine to continue it, of course, because that is likely your child’s expectation. Mostly, I want to encourage you on your journey!